What is the #AVselfie and where did it come from? You may have wondered this aloud at some point this week. The popular hashtag gained traction in in our timeline over the past few days in anticipation of InfoComm14. 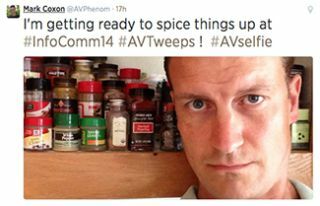 @AVPhenom's selfie caught our eye the most, but we expect to see even more creative interpretations of the industry-tagged single shot next week. For now, check out this week's best tweets. Follow @SCNmagon Twitter for more pre-show coverage.